Size doesn’t matter! At least not when you’re decorating your balcony or patio. Even the coziest outdoor spaces can be transformed into your own private paradise, perfect for sharing a morning coffee, relaxing with a good book, or enjoying cocktails and dinner at sunset. 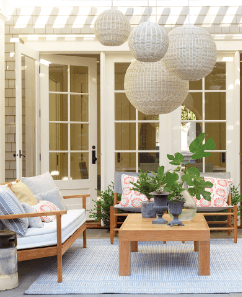 The key is to treat your outdoor space as you would an indoor room. Pick a theme – such as classic contemporary, beachy, exotic, or Tiki-cool – and decide on a color scheme. Then, the pieces will start to fall into place, so to speak! 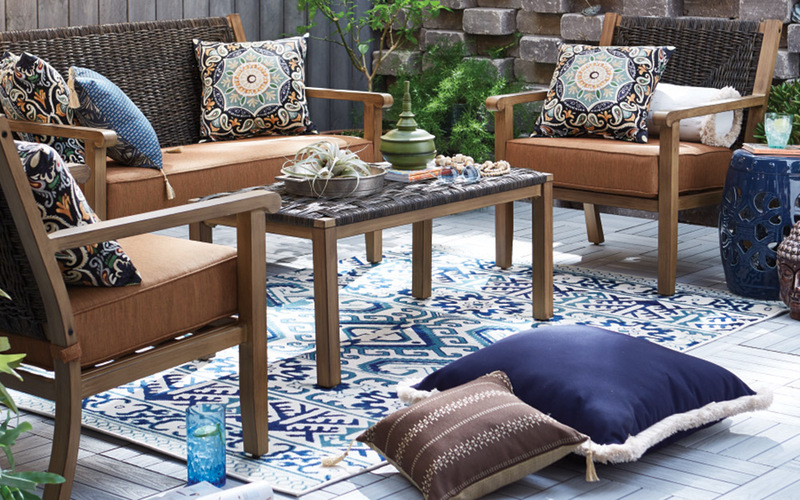 Consider an outdoor rug for a cohesive, pulled together look. Add some greenery with planters, a trellis or two, small wall garden, flowering plants, or even a mini herb garden. And for the final touch, set the mood with globe lights, lanterns or candles. 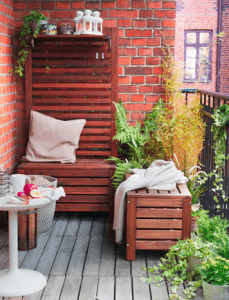 Here are some cozy balcony and outdoor decor ideas to get you inspired! 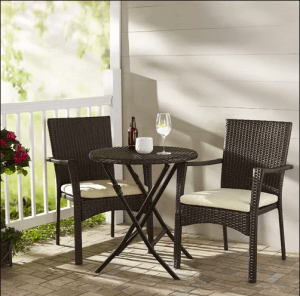 Whether you’re settling down to a sunny Sunday brunch or an intimate starlit dinner, adding an outdoor dining set to your patio or balcony is a great option for making the most of your outdoor space. This three-piece set is perfect for adding bistro-inspired dining to your home. Including a table and chairs, this set is crafted from an iron frame wrapped in resin wicker for a weather-resistant touch. Cushions are included for a padded accent, and the table folds for a space-conscious touch. The ÄPPLARÖ dining set is the perfect size for smaller balconies or patios – and the table can be extended for relaxing meals with friends. 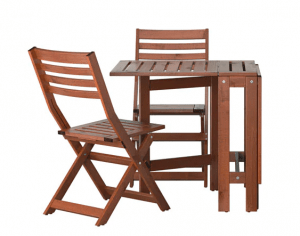 Set includes brown stained acacia table and two folding chairs. Acacia is a naturally durable and sturdy hardwood for outdoor use because of the high density of its wood fibers. For maximum protection it’s pre-treated with wood stain. By re-staining now and then you can enjoy it for many years. Perfect for stowing away your gardening tools and plant pots, this storage bench also works as an extra seat or place to put things on. The matching wall panel provides a cozy backdrop and comes with six hooks for hanging whatever you please. Optional shelving is ideal for displaying plants and outdoor decor. 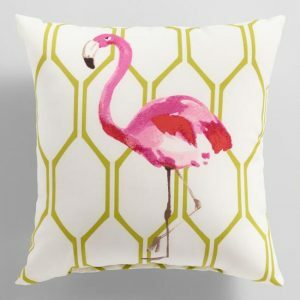 Liven up your lounging space with a fun flamingo throw pillow from World Market. Featuring their exclusive pink watercolor-style bird and a lime-green gate print, it brings a vibrant tropical vibe to any outdoor area. World Market has a large selection outdoor furniture and accessories including cushions and pillows, rugs, lighting, plants, and gardening tools. 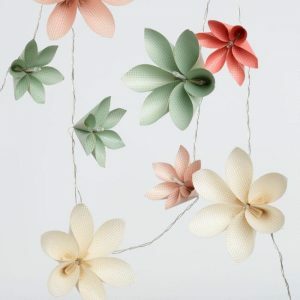 Battery-operated string lights feature ten origami-like flowers, each with a glowing LED light center. These pink, white and mint flowers are hand-folded by artisans in India from paper embellished with metallic gold polka dots. Perfect for accenting a tabletop display or wrapping around your decor, this string of lights also looks beautiful arranged with real flowers. 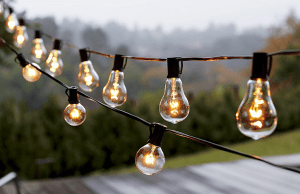 String lights add a warm glow to any outdoor space. Recreate the night-time romance of a Parisian bistro by hanging string lights in a crisscross pattern under your balcony roof or suspend them from poles erected at each corner of patios and decks. Create illuminated wall art by arranging them in a geometric pattern on a solid outdoor wall. Use string lights with smaller bulbs (similar to the holiday variety) all year round to dress up balcony railings, large plants or trellises. For subtle glow and sparkle, look for tiny bulbs strung along a delicate wire wrap. Outdoor lighting is the ultimate shortcut to ambiance, but it has a practical purpose, too. There should be enough lighting so that your guests can see to safely walk around, interact with one another, enjoy their cocktails and balance their plates. 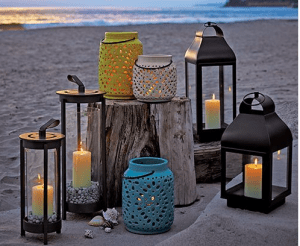 Lanterns are an easy solution thanks to their sturdy proportions and glass enclosures that keep flames protected from wind. Place a lantern on top of an accent table next to a lounge chair. Consider hanging a few on a wall panel or suspending them from hooks along a roofline. Outdoor rugs are great way to integrate indoor and outdoor living, and create a colorful cohesive effect for your outdoor decor. Serena & Lily outdoor rugs are weather-resistant, easy to clean and ideal for use on your patio or porch. Crafted from Perennials® Performance Fabrics, these outdoor rugs have lasting beauty thanks to their resistance to UV radiation, mold, mildew, and staining. In fact, they look so good season after season, and are so simply chic, they are also perfect for use indoors as well. Looking for a pop of color or a handy side table? 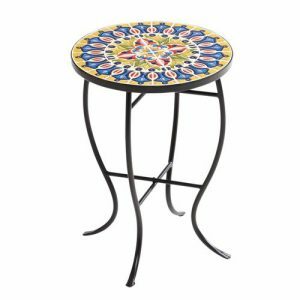 Hand-placed ceramic tiles create a kaleidoscopic pattern in mosaic on this small accent table, while the modern base adds contemporary elegance. 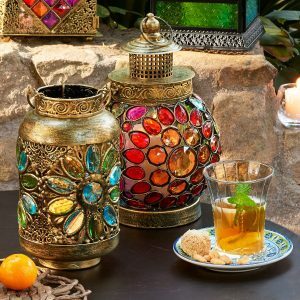 Set with brilliant colored gems arranged in a fun floral pattern, this handcrafted lantern promises to make a spectacle of itself—in the best possible way. Day or night, it creates an enchanting ambience with or without a candle. Pack your favorite wine glasses and heirloom china away for summer. 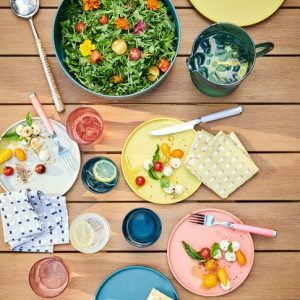 Outdoor acrylic and melamine dinnerware is great way to bring some color outdoors without the risk of breakage. Today’s products are so realistic, you’ll never know they are not made of glass and ceramics. Bright and light, designer Aaron Probyn’s sleek, modern update of melamine plates brings unbreakable style to outdoor dining. Rimmed plates make carrying food even easier (no spills!). In summery hues, they’re fun to mix and match anywhere from picnic to pool to dinner party. 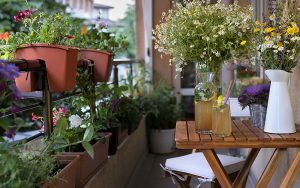 Bring some life to your balcony or patio with container gardening. Fill planters with flowering plants of your choice, set up flower boxes to adorn your railing, or create a simple shelf to hold smaller potted greenery. Go the extra mile by installing a plant trellis made from wood or plastic. Place the trellis against a wall and let the plants grow vertically. This takes up less space and is a great way to add a garden on smaller balconies. Your balcony trellis can also be positioned as a protective screen to offer additional privacy.